I find that life with a toddler and a dog, is sort of like having two children. Before Ez came along, Angus was my baby. I worried about leaving him alone too long, I bought him treats when I went to the farmers market, I felt guilty doing any exercise without including him. Now Angus has moved down the food chain. He was never a cuddly, needy, attention seeking dog, he is a little more aloof. So Thankfully he wasn't bothered about a baby entering the house, he was interested, but not much more than that. Soon enough the baby started to move, and developed a very, very keen interest in this black dog whose tail points straight up and waves like a flag begging to be grabbed and pulled. The dog still wasn't interested, until he realised that the baby was a goldmine of manna thrown from heaven (otherwise known as a highchair), and he was bought off, and now they have teamed up against me. Me: "Ezra, be gentle. Angus NO. Ezra NO, Angus get back here, Ezra let go of his tail, Angus drop it, Ezra no that is gross, it was just in the dogs mouth, Ezra be careful, Ezra don't give that to Angus, Angus NO that isn't yours, Ezra NO, let go of his tail, Angus settle down, Ezra NO that is Angus's food, Ezra No don't give that to Angus. Angus, do you want to go outside? These two are double trouble when they join forces of destruction. Angus is generally a pretty easy going dog. Except when we go on walks, then he acts like he has some crazy desperate mission of sniffing every blade of long grass he possibly can. When the people in the house are calm and relaxed the dog is calm and relaxed. Never calm and relaxed, always running around doing his best to hype up the dog. They feed off of each others energy, and before I know it they are both running around the house like crazy, often the toddler being dragged around, refusing to let go of the dogs tail. They watch each other, one grabs something to play with, the other has to have it. 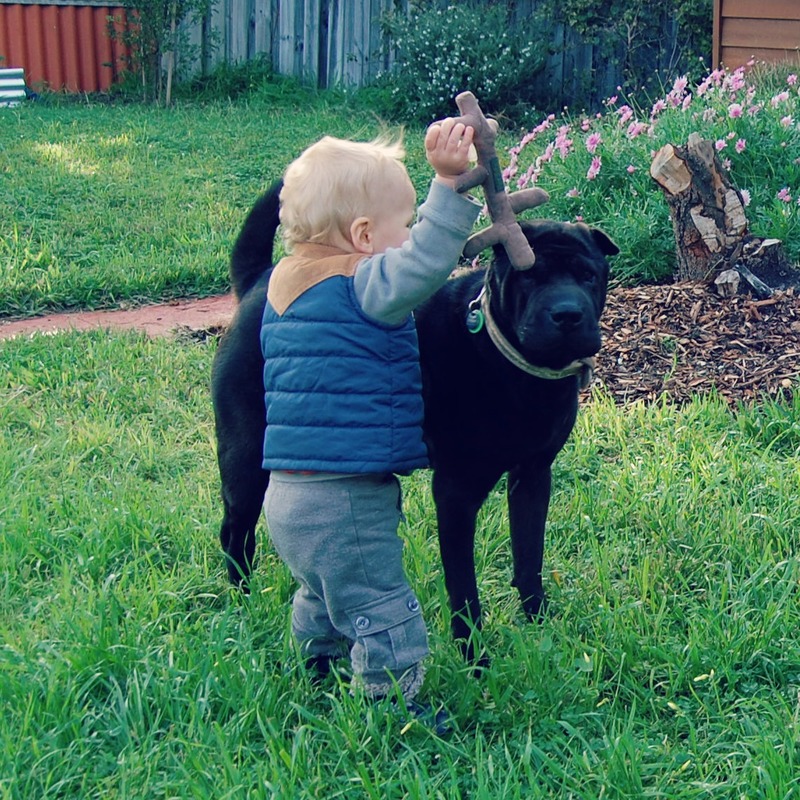 Good thing Angus is a gentle beast, who carefully steals food and toys from the child. They love all the same things. Angus pretends he is annoyed with Ezra, and yet, he doesn't leave, he keeps coming back. They play this game all day. Ezra cannot help himself, he has to torment Angus. He holds on to his tail and doesn't let go for anything. He tackles him whenever Angus is lying down relaxing. He pulls his legs out from underneath him as he walks by. But, when Ezra is crying, Angus is there. He comes and finds me, he is worried about his friend. The neighbours say Angus is way more protective now than ever before. They have an older brother, little brother type of relationship, and it is really sweet (yet somewhat annoying for me). I remember what it was like having a dog as a child, and the bond you form with them is really one of the most special things in life. It is really amazing to witness it develop between these two. What is life like in your house? Do animals and kids combine to wreak havoc on the adults? 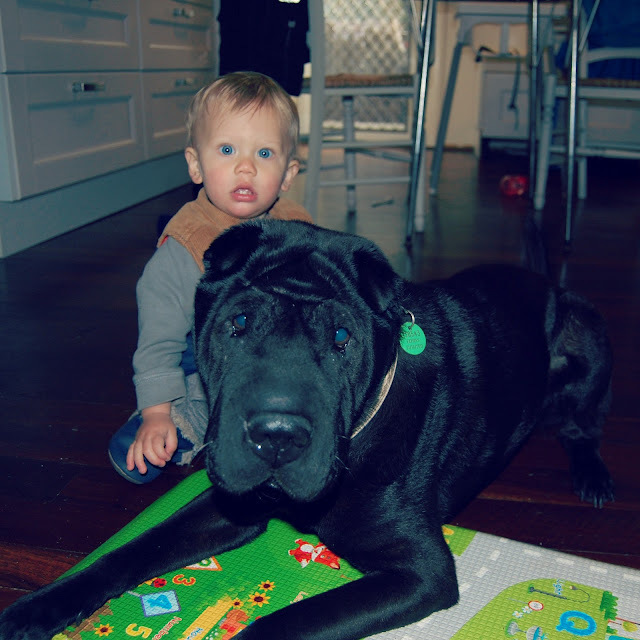 In case you are wondering, Angus is a Shar-Pei, with a facelift to prove it! 20 comments on "The Truth About Kids and Dogs"
Hahaha love this post Karen! I wish Salome could have a little dog friend! I agree it is the most special bond and friendship! That's just beautiful! Our poor old dog just avoids our kids, she's always preferred adults. Occasionally she submits and sits still while the cuddle, poke and prod her, but her face always says "Ugh fine just two minutes then I'm outta here." The best part is when she retreats to her kennel and they try and climb in with her! oh thats so sweet!!! puppy love! I think pets are so important for kids! My girls used to be scared of a cat we used to have who would hide under their beds and jump out and attack their feet when they were getting into bed! Bedtime was such a drama of trying to find the cat and carrying the kids to bed! Yes we have the same water bowl obsession problem, I end up mopping up spilt water at least once a week because I forgot to move the bowl! Why do they love it so much!! I agree, they seem to understand the difference between adults and children and have so much patience! Oh I will check it out, dogs definitely know they are not number 1 anymore, and they can chuck little tantrums as well, they know how to get your attention thats for sure! She can come and bond with Angus!! ha, he wouldn't mind! Oh no! Bedtime is a big enough drama as it is, cats are so funny like that, we used to have one that would incessantly lick our faces in the middle of the night whilst purring really loudly. Sweet and crazy all at the same time! They turn my house upside down! Great the dog got the facelift and not you ... (jeez, I'm on a roll today). BTW, love the blog title. Aloha - popped in from the blog hop. Oh, the two of them together are so adorable! And I would love to witness the older brother/younger brother relationship in action. We can't wait to welcome a dog into our home.